12 Years a Slave and Schindler’s List: How American movies valorize those who escape history’s tragedies. No doubt that’s not an impression anyone involved with this movie wants to give, and in fact, the filmmakers make a few moves to supplement the film’s focus on a single exceptional character. For one, a note at the end reminds us that most kidnapped slaves were never rescued. There’s also a remarkable shot in the middle of the film: After a slave dies on his feet in the cotton fields, McQueen puts us in the slave’s point of view as Northup buries him, as if to say, “This is how it could and did end for millions of people.” But though the moment is chilling, it’s not as effective as it might have been: We’ve never really met the dead man. He remains an anonymous adjunct to Northup’s story. Only for the length of one shot are we asked to look through his eyes. The filmmakers’ richest attempt to complicate the individual focus comes from a subplot about another slave, Patsey (Lupita Nyong’o), who is raped by her sociopathic owner, Edwin Epps (a frightening Michael Fassbender). * These scenes are among the hardest to watch, but they are morally straightforward: Patsey suffers, Christlike, eventually asking Northup to kill her. Remaining noble, he refuses. But McQueen and screenwriter John Ridley almost complicate the relationship in a terrifying scene near the end of the film, when the deranged Epps forces Northup, at gunpoint, to whip a naked and bound Patsey. This is the moment when the filmmakers are most poised to challenge Northup’s individual strength; slavery has simply put him in a position where it is impossible to stay pure. Yet the film flinches here, I think. Patsey tells Northup that she’d rather he whip her than let Epps do it; remaining the perfect martyr, she absolves him. (Though the film is apparently very loyal to the real Northup’s text, it’s telling that this line is Ridley’s, not Northup’s.) He does indeed whip her, but Epps soon takes over, leaving Northup free to chastise him defiantly from the sidelines. So 12 Years a Slave allows Northup and Patsey’s relationship to end with a tender embrace, as he regains his freedom. It plays as tragic, because we know how horrible Patsey’s life will continue to be. But it’s pure. The film limits the emotional and moral complexity here because it can’t afford to risk our identification with Northup. The thing that has been exalted and the thing that American entertainment is consumed with is the individual being bigger than the institution. … That’s the story we want to be told over and over again. And you know why? Because in our heart of hearts what we know about the 21st century is that every day we’re going to be worth less and less, not more and more. We’re so acclimatized to individual catharsis in entertainment that we barely even notice it; we are hard-pressed to imagine other narratives. 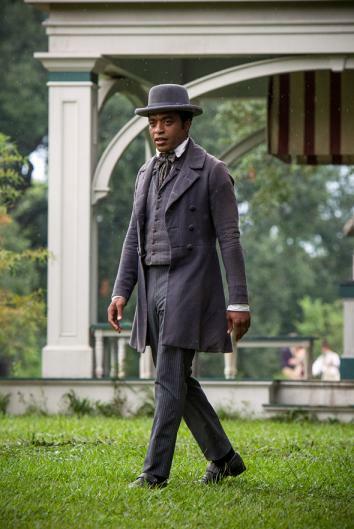 So perhaps it’d be fairer to say the limitation is not with 12 Years a Slave but with us as an audience. It’s just so hard for us to identify with “the regular slaves,” in whatever form they may take. 12 Years a Slave is constructed as a story of a man trying to return to his family, offering every viewer a way into empathizing with its protagonist. Maybe we need a story framed on that individual scale in order to understand it. But it has a distorting effect all the same. We’re more invested in one hero than in millions of victims; if we’re forced to imagine ourselves enslaved, we want to imagine ourselves as Northup, a special person who miraculously escaped the system that attempted to crush him.